Expand your business' offering by white-labelling Telcom's superfast connectivity and VoIP products, branded as your own. We are proud to have built a reseller programme that focuses on looking after our partners and delivers a great service to their customers. Telcom is one of the first and only service providers in the UK to offer a wholesale fixed pricing model across the board for wireless delivery of leased lines ranging from 30Mbps to a blistering 1Gbps (1000Mbps). Our state of the art network ensures you and your customers receive the UK's best superfast broadband service, installed within 28 days and delivered against our top level SLA, guaranteeing a minimum of 99.95% uptime with a maximum 4 hour break fix should a highly unlikely issue occur. Join our Partner programme as a reseller. You will be provided with a dedicated telcom team member who will make sure you have all the information you need and help you get set up. When you want us to set up a new order, use our portal to request a connection or other product from us. 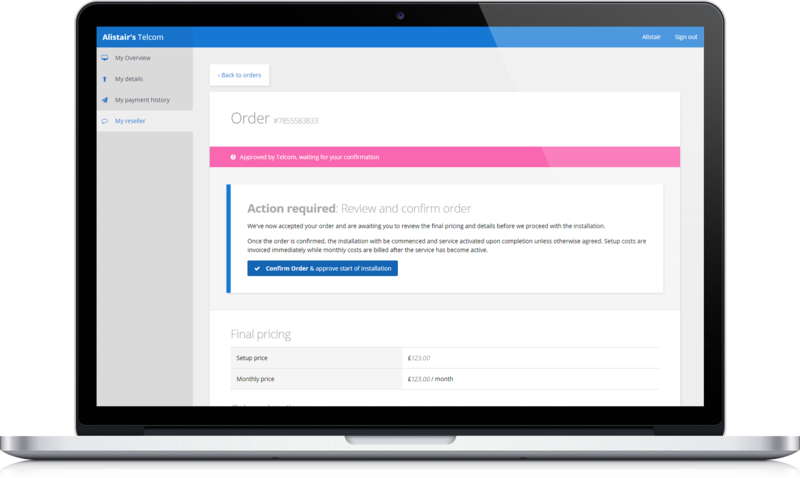 You can manage and get information about each stage of the order setup process. Our reseller programme is designed so that you maintain your personal connection and brand with customers so we don't get in the way; Your account manager can even attend client meetings with you if required. No minimum/maximum order requirements. No targets. No expectations. Fast setup time. Wireless connections ensure a considerably quicker turnaround than fibre. No digging, less hassle.